Here is a picture, interesting but with profound implication. As is vividly depicted in the photo, two men are running away from the computer screen, which successfully captures our eyes. 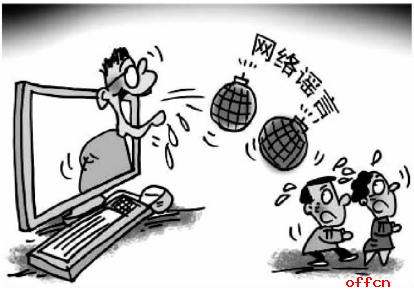 After a close watch, it is not difficult to find that they are frightened away by the internet rumor. Apparently, what the drawing has subtly conveyed is supposed to be given further analysis. A conclusion could be drawn from the picture: internet is likely to produce negative effect to our life. And my words are based upon the following two reasons. On the top of the list is that the lack of legal penalty may lead to the state of this phenomenon. In addition, there is the other point that no one can ignore. It is universally admitted that internet is a virtual world, and people in it are more likely to do something illegal and cruel.